The "Icons of Music," auction held Saturday, April 21, 2007 in New York to benefit Music Rising, a campaign co-founded by U2's The Edge, raised $2.5 million. Julien's Auctions conducted the sale and bidders from around the world paid record prices for some of the most iconic rock memorabilia ever offered to the public. Music Rising, administered by the Gibson Foundation, was launched in 2005 and has since won numerous awards. To date the campaign has aided more than 2,400 professional musicians and more than 20,000 students and parishioners of the Gulf Coast region. The Edge's beloved 1975 cream Gibson Les Paul Custom guitar which was played on every U2 tour since 1985, sold for a record $240,000. His Gibson ES-295 Archtop guitar brought $105,000 and Bono's signed Irish Falcon Gretsch guitar brought $187,500. The auction marked the first time such a wide selection of U2 memorabilia was available to collectors. Among the more than 200 items sold were former President Bill Clinton's saxophone ($54,000), a pair of John Lennon's round, blue-tinted sunglasses ($30,000), Edge's Ethiopian necklace worn in "The Fly" video ($27,000), Bono's Armani sunglasses and signed case ($24,000), Adam Clayton's studio played bass ($23,000), Larry Mullen's Tom drum used on the Vertigo tour ($19,000), Paul McCartney's hand-painted and signed Epiphone Texan ($63,000), Kurt Cobain's MTV Award ($40,800), Slash's Signature model signed Gibson guitar ($20,000), The Edge's jacket ($33,000), and a guitar owned by Jimi Hendrix sold for a record $410,000. Other highlights of the auction and results can be viewed on the Juliens Auctions website beginning Monday, April 23,2007 at www.juliensauctions.com. The final amount going to the charity will be tallied up, with some items having the total selling price going to Music Rising, and other items designated a portion of the proceeds to the charity. Supermodel and actress Christy Turlington co-hosted the event which opened with "The Saints Are Coming" video, followed by a special performance by the Preservation Hall Jazz Band straight from New Orleans. 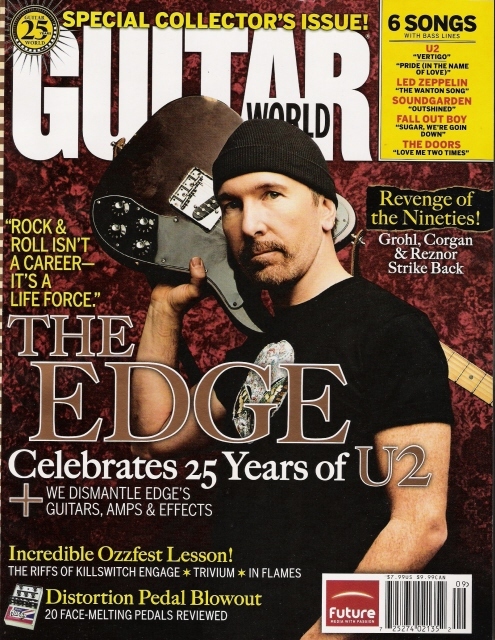 Before the paddles went up, The Edge welcomed the crowd and later was the recipient of a special donation by the Hard Rock New York, in exchange for a Music Rising Epiphone guitar signed by The Edge, which will be displayed as a sign of hope in the Biloxi, Mississippi Hard Rock location. The auction ran for several hours as bidders from around the world were vying for a piece of musical history either by phone, online or on site. The night ended with a special closing performance by legendary musician Allen Toussaint, which was standing room only. Music Rising, a campaign launched in 2005 to replace musical instruments lost or destroyed by hurricanes in the Gulf Region. The initiative continues to aid those in need through its consistent efforts to aid professional musicians, churches and schools. Music Rising was formed in late 2005 by U2’s The Edge, legendary producer Bob Ezrin, Gibson Guitar Chairman and CEO Henry Juszkiewicz. Partners of the campaign represent the most diverse partnership in the entertainment industry and include MusiCares, Guitar Center, Musician’s Friend, Live Nation, Kennedy/Marshall, Ticketmaster, Hard Rock International, VH-1, MTV, Real Networks, ABC News Now, The NFL, Rolling Stone, Mr. Hollands Opus, ACT and the Bush-Clinton Katrina Fund. Former President Bill Clinton has even participated in press coverage for the campaign when he presented a Music Rising Gibson Les Paul guitar to a recipient in Baton Rouge, LA in 2006. Music Rising is the recipient of the prestigious 2005 HALO Award for Cause Marketing and the 2006 Billboard Humanitarian Award and has been recognized around the world by various media organizations. Music Rising is administered by The Gibson Foundation.For more information on Music Rising go to www.musicrising.org or www.gibsonfoundation.org.